What does higher education have to do with the economic development of a region? 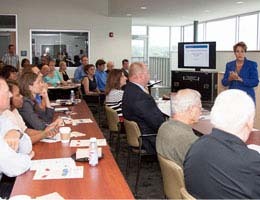 “Plenty,” according to Tidewater Community College Chesapeake Campus Provost Lisa Rhine, who was the presenter at the July meeting for the City of Chesapeake Economic Development Advisory Committee (EDAC), held in the newly opened Chesapeake Student Center. For starters, she said, “College graduates and those with some college, earn more and pay more taxes than those with a high school education or less.” She also noted that college graduates are less likely to be unemployed, according to the U.S. Bureau of Labor Statistics. Rhine continued by noting that college graduates are more likely to vote, volunteer and be in very good or excellent health. Rhine talked about the future growth of the Chesapeake Campus, including a four-story parking garage on tap for groundbreaking by September and a new science, technology, engineering and math (STEM) building that is the next to be constructed by the Virginia Community College System on campus. The EDAC meeting concluded with tours of the Chesapeake Student Center. Learn how TCC is educating a workforce in Hampton Roads. Visit Center for Workforce Solutions.